评论: Waiting for buying to be absorbed before entering short here. Technical traders started buying LTC but I believe longer term smart money is selling. They will either sell into their buying here for a sideways move during a few days, or let them buy and short again higher. If price erases last week's range, then buyers won. We can short once the buying momentum is exhausted. This will break down explosively. Just don't buy it...shorts, if in, trail stops gradually. and us long term Bulls?? Just hold on or fold entirely!??! I think you will be right eventually but I think we have a move up to .018 or so, possibly even higher first. @btc_joe, we will have to wait and see. I'm not trading the LTC move myself, but I can see it being extremely risky to hold...wouldn't reccomend it to anyone. @IvanLabrie, I think it will go the way of the overall market, I think in the short term bitcoin bounces to 7500 here, possibly as high as 8500-8800 or so. If correct alts will briefly outperform. Then bitcoin makes new yearly lows and then ya I mean the vast majority of alts will likely go through an ominous cycle. 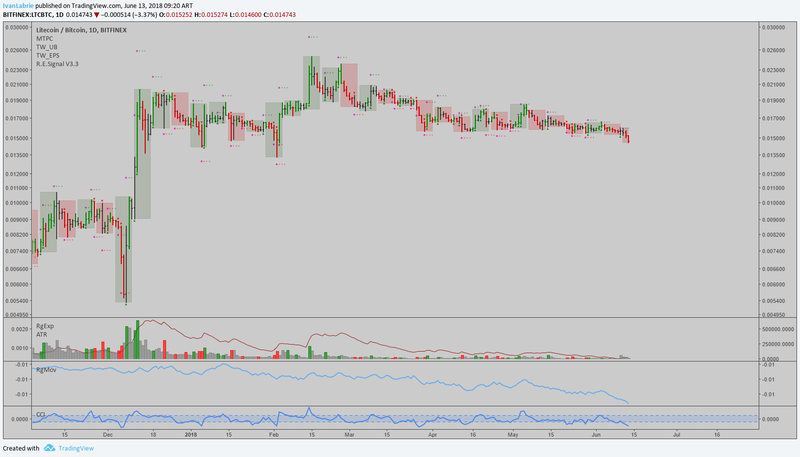 For ltc I could easily see it going to .008 or something like that. So definitely risky in the current crypto cycle we appear to be in, but personally I will be looking to accumulate when the panic hits. Keep in mind the ltc having will be a year before bitcoins : ) Just my take. Thanks for all the good work. @btc_joe, that seems practically impossible to me. 8500-8800, as close to impossible as possible. You would be indeed wise to buy after this trend here bottoms...I'd buy a larger allocation in BTC, ETH, then some % for a few other coins and ICOs maybe. @IvanLabrie, haha touche, u could be right, time will tell. Could is key word. Below the stop loss, within the timeframe, price can fall to the targets on chart. Would need to show obvious signs of contraction of the ranges for me to doubt. These signals are in line with the long term trend here, odds are very high. Let's wait and see. Sentiment doesn't inspire me to buy.